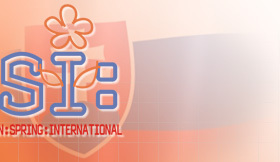 The competition is organized in line with the rules of the Assocation of Slovak Agility Clubs that are based on the FCI Agility Reglement. The organizers retain the right to change the programme, judges, number of competing teams. Free running of dogs is not allowed (in particular close to the rings). The owner/handler takes all responsibility for damages caused by a dog. Should the competition not be held for unforeseen circumstances, the entry fees will be retained by the organizers and used to cover the expenses. Please keep the competition area clean (clean up after your dogs). It is forbidden to smoke, drink alcohol and/or take any illegal drugs in the competition area. Participation: Competition is open to all dogs over 18 months of age with valid competition licence / record book. In order to be eligible for the C.A.C.Ag./res.C.A.C.Ag. certificate, the competitior must have a photocopy of the dog's FCI pedigree available. Veterinary conditions: The competitors must show an EU pet passport or a vaccination passport during the registration, in which it will be clearely stated that the dog in concern has valid vaccinations against rabies, distemper and parvovirus. Obstacles used: single jump, wall, long jump, tyre, weaves, tube tunnel, flat tunnel, see-saw, dogwalk, A-frame. Jump heights for category A1: S - 25 cm, M - 35 cm, L - 55 cm. Obstacles used: single jump, spread jump, wall, long jump, tyre, weaves, tube tunnel, flat tunnel, see-saw, dogwalk, A-frame. Jump heights for categories A2 and A3: S - 30 cm, M - 40 cm, L - 60 cm. Obstacles used: single jump, spread jump, wall, long jump, tyre, weaves, tube tunnel, flat tunnel. Conditions for entering the veteran class: dog age 9 years and more for small and medium, 8 years and more for large. Obstacles used: single jump, long jump, weaves, tube tunnel, flat tunnel, dogwalk, A-frame (spread jump, wall, tyre and see-saw will not be used). Jump heights: S - 20 cm, M - 30 cm, L - 40 cm, lowered A-frame. Veterans will run exams for A2 category and open runs (the courses might be slightly changed due to above-mentioned obstacles restrictions).